Bolden, picked up by the Bills after being waived by the 49ers during the season, only saw three offensive snaps for the team in two games. However, he brought back five kickoffs for 116 yards (23.2 average). Analysis: The Bills fired special teams coach Danny Crossman immediately after the season, so Bolden will probably have to start fresh and audition for a new coach. If he couldn't crack the offense with a weak corps of wide receivers, that's not probably going to happen in 2019 with the team expected to stock up on the position this offseason. His best bet will be to try and win a main return job. Bolden, signed off the 49ers' practice squad last week, received three kickoff returns for 72 yards in Sunday's loss to the Patriots. Bolden was signed by the Bills on Tuesday, Matthew Fairburn of The Athletic reports. Analysis: Bolden appeared in four games with the 49ers earlier this season before being demoted to the practice squad, but he'll have another chance at regular-season action as a member of the Bills for their final two contests. Unfortunately for Bolden, there are plenty of other healthy options at receiver in Buffalo behind Zay Jones, Robert Foster and Isaiah McKenzie. The 49ers signed Bolden to their practice squad Thursday. Analysis: Bolden was waived by the 49ers earlier this week, and he ultimately rejoins the team as a member of the practice squad. The 23-year-old logged one reception for 10 yards during four games with San Francisco this season, and he'll now work to earn another shot at a depth role with the team. Bolden was waived by the 49ers on Tuesday, the team's official site reports. Analysis: The second-year receiver out of Oregon State appeared in four games with San Francisco this season, catching one pass for 10 yards. Bolden will look to join another team in search of depth receiver or option in the return game. Bolden had one catch (four targets) for 10 yards in Sunday's loss to Arizona. Analysis: Bolden made his 2018 debut after serving a four-game suspension to begin the season. The speedy wideout appeared to have scored the first touchdown of his career on a quick strike from C.J. Beathard, but replay review showed that he was touched down at the one-yard line. Bolden's four targets ranked fourth amongst San Francisco wideouts, but his role is likely to diminish once Marquise Goodwin (hamstring) and/or Dante Pettis (knee) return from injury. Bolden (suspension) has been reinstated by the league, Matt Maiocco of NBC Sports Bay Area reports. Analysis: Despite the reinstatement, Bolden's immediate future depends on whether the 49ers will choose to activate him. San Francisco has a week to decide on Bolden's value. Bolden was issued a four-game ban over the summer for violating the league's policy on performance-enhancing substances. Bolden has been suspended for the first four games of the 2018 season for violating the NFL's policy on performance-enhancing substances. Analysis: Bolden was primarily being used on special teams last season as a return man before an ankle injury caused him to land on the team's injured reserve. Should he make the team's final roster, he'll now have to wait until at least Week 5 to make his return to the field. However, the suspension could lead to the 49ers releasing Bolden. 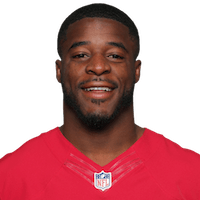 Analysis: Bolden injured his ankle in Sunday's win over the Texans, and totaled 396 yards on 19 kickoff returns in nine games for the 49ers this season. Receiver Trent Taylor is one possible candidate to take over on kickoff returns. Bolden has an ankle injury and is questionable to return to Sunday's game against the Texans. Analysis: The undrafted rookie is deployed mainly in the return game, and he has no receptions yet this season, so the offense won't be affected much by his injury. Trent Taylor will likely return kickoffs in the meantime. 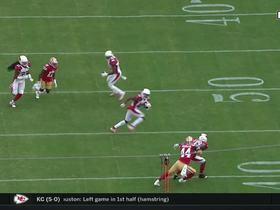 Arizona Cardinals cornerback Bene Benwikere picks off San Francisco 49ers quarterback C.J. Beathard and takes it 21 yards. Los Angeles Rams wide receiver Pharoh Cooper fumbles a crucial kickoff return in the fourth quarter and the San Francisco 49ers recover.